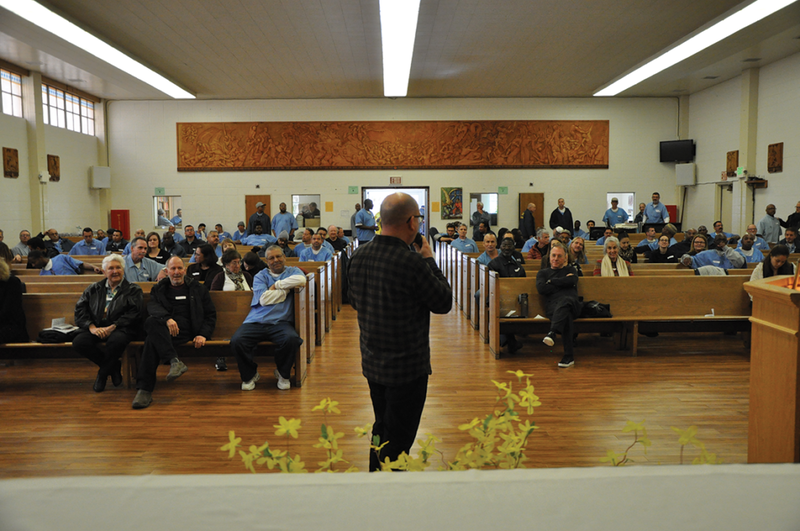 Before he paroled from San Quentin in 2010, Leonard Rubio started the Restorative Justice (RJ) Interfaith Roundtable. On Feb. 9, he returned to speak at a symposium about the harm a burglary caused his wife. 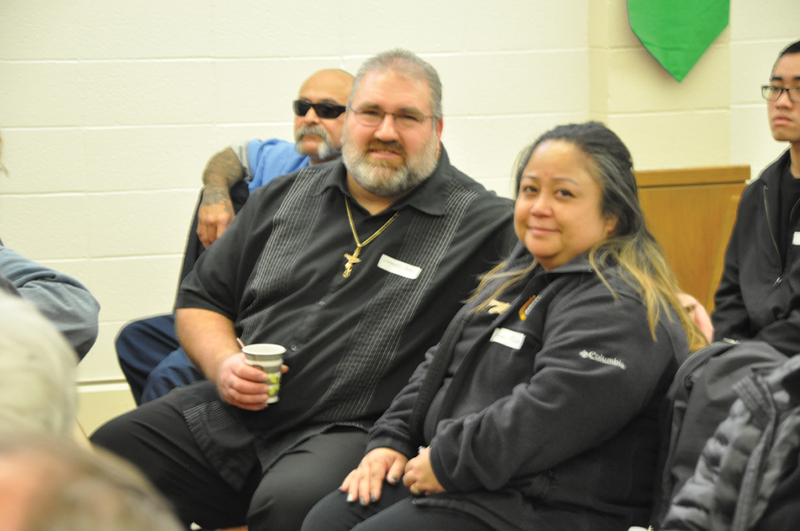 The Harms of Non-Violent Crime held by The San Quentin Restorative Justice (RJ) Interfaith Roundtable came about because some people convicted of non-violent crimes claimed they haven’t hurt anyone. The impact of the burglary committed against the Rubios became apparent as Aouie Rubio fought back tears as she talked about the day someone stole her sense of security. When the violation happened, the Rubios lived in Richmond, California where their home was under constant attack – car break-ins, stolen packages. They fought them off with alarms and a Ring doorbell system, which had added a microphone, camera, and motion sensor to the front door. Yet in 2016, a female broke four doors be- fore finally getting into the home through the back. A. Rubio watched her through her Ring system on her cellphone but the po- lice didn’t arrive in time to catch the person. They made off with $2,500 in electrical equipment L. Rubio struggled to purchase for work. “She probably sold them for $500, no big deal to her,” L. Rubio said. Now L. Rubio works as the Executive Director of Inside Prison Project and lives in a much nicer neighborhood but still is affected by the burglary. 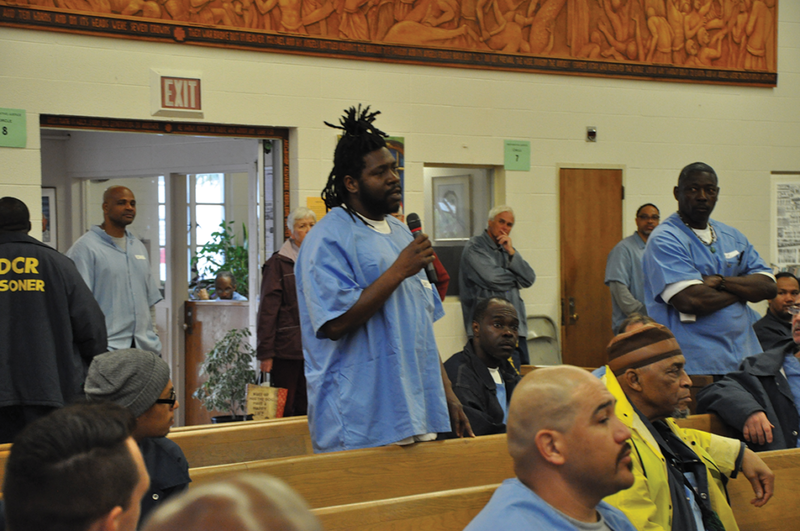 After the Rubios presentation, several incarcerated men stood up to apologize. For A. Rubio, the event was her first time publicly talking about the burglary and she said it grounded her. After the Rubios, host George “White Eagle” Coates, introduced the next guess speaker, Kevin Mc-Cracken, who said he has been sober for 20 years and is now the CEO of Social Imprints. He hires returning citizens as a way of making amends for his years as an addict when he thought shoplifting was no big deal. He talked about the impact of his brother’s drug addiction and theft. Two incarcerated men closed out the symposium with short talks about victim-offender dialogues they had with survivors of the violent crimes they committed. Jason Samuel shot police officer Tom Morgan back in 1997. The officer came to his parole board hearing to get Samuel denied parole but during the hearing, he heard about all the changes Samuel made and self-help groups he completed. At the next parole board hearing, the officer supported his parole release. Since then, the two have met and embraced each other. Next, Texan Alan Mabrey talked about meeting the mother of a 24-year-old girl he killed while driving drunk.